Areas of patchy fog early. Overcast. High 53F. Winds WNW at 5 to 10 mph..
Sydney “Skip” Friedman, 92, of Shaker Heights died Feb. 23, 2017. Skip was born in Cleveland on April 24, 1924, to Louis and Pearl Friedman. He graduated from John Adams High School in 1942. The son of eastern European immigrants who came to Cleveland in 1922 to carve out a better life for their sons, Skip naturally enlisted to fight in World War II. 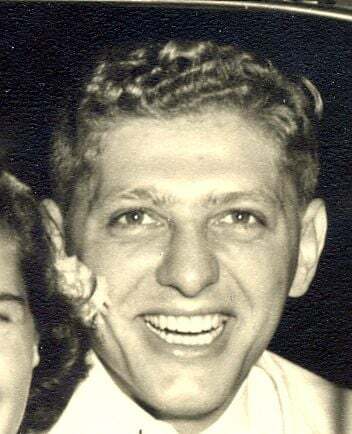 In spring 1942, as he was departing for basic training in Alabama from Cleveland Union Terminal, a group of what Skip would have called “coeds” came to “say goodbye to the boys.” Among those women were the Klausner twins, Penny and Ruth, and as the men boarded the train, Penny suggested the two of them write to each other. That fateful meeting, their correspondence and two dates before Skip shipped overseas, sustained him through the terrors and sorrows of war, that included being captured at the Battle of the Bulge. He became a POW at Bad Orb and ultimately endured Stalag 9A at Ziegenhain, Germany, until he was liberated on March 30, 1945, during the week of Passover that year. He decided in that moment that he would never have a bad day and he didn’t. To watch a recently released video about the man responsible for saving Skip’s life and the lives of other Jewish POWs in Germany featuring an interview with Skip, go to vimeo.com/198357872. After the war ended and Skip came home, the two became inseparable for the next 65 years. They married in 1948 and moved to Shaker Heights in 1959 where they lived the rest of their lives. Side by side, they raised their four children while he worked as a lawyer and she as a social studies teacher at Shaker Heights High School. Together, they built cherished friendships, participated in innumerable community and political activities, cheered on Cleveland’s sports teams and traveled the world. Skip’s devotion to Penny was unwavering; he cared for her through her many years of dementia, even moving his law practice home to be with her and in her last years, and visiting her daily at Montefiore. Skip cherished each day and touched countless others with his brilliant mind (family dubbed him Skipipedia), optimism and generosity. He adored his 10 grandchildren and was especially grateful to Cassandra, who moved in with him in late 2014 and whose presence helped him to continue to live joyfully at home. In early 2016, at 91, he was hospitalized, and with his indomitable optimism, celebrated the fact that this was the first time he had been in a hospital since he was 16 when he broke a leg playing football for John Adams High School. He bragged about having the “world’s best doctors,” and by July, home again, he continued to value each day. His family is grateful to everyone at Cleveland’s VA Medical Center and especially for his team’s support in helping to bring him home where, surrounded by stacks of his books, his loved ones, and photos of Penny, he died peacefully. Skip served as board chair of Metropolitan Hospital during a time of significant growth and was also a member of the board of directors of Montefiore. He was a congregant at Anshe Chesed Fairmount Temple. Skip was a member of the local, state and federal bar associations. He enjoyed sports, politics, social justice, reading voraciously (especially history), spending time with his family and friends, watching movies on Turner Classic Movies, walking with Penny, and playing tennis. He and Penny were international travelers and enjoyed spending time on the beach. Skip is survived by his children, D. Rachel Friedman of Cleveland Heights, Peter Friedman (Marina Coleto) of Shaker Heights, Karen Friedman of Cambridge, Mass., and Amy Friedman (Dennis Danziger) of Los Angeles; grandchildren, Zena, Callie and Sophie Levan, Matthew, Alexander and Rafael Friedman, Kate (Jenny Kay, fiancé) and Max Bock, Sarah and Cassandra Fraser and Jesse Max and Molly Danziger. He is also survived by his nieces and nephews and their families – Lawrence Warren and Richard Friedman; Tom, Jim and Tera Abelson and Margie Yemini; and Paula and Lisa Klausner. He was predeceased by his wife, Pearl “Penny,” to whom he was happily married for 62 years; and his brother, Morris Friedman. Services were held Feb. 24 at Berkowitz-Kumin-Bookatz Memorial Chapel. Interment was at Mayfield Cemetery. Contributions are suggested to the Southern Poverty Law Center and/or POPStheclub.com.